Details to follow May 2019 with anticipated June 2019 application date. 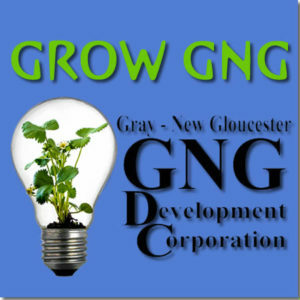 In early 2016, the Gray New Gloucester Development Corporation proudly announced its newest economic development program, the Grow GNG Challenge. Gray and New Gloucester are sister communities that share a school district, MSAD 15. The two towns cover an area of more than 80 square miles, offering everything from rural agriculture to downtown village locations for just about any business. New Gloucester is more rural with many artisans, crafters, farmers, a quaint ‘Lower Village’ and it’s ‘Upper Village’ on Rte. 100. Gray is located at Exit 63 of the Maine turnpike and is by no means short of agriculture, but is also offers a larger central village area with a high traffic count where retail is well suited. The outskirts of both towns lend themselves to technology or light industrial businesses and land is plenty. Portions of both towns are served by public water, and most recently, a 2 mile stretch south of Gray village on Rte. 100 has been enhanced with a fiber-optic build-out that offers symmetrical internet connectivity at speeds ranging from 50 Mbps to 150 Mbps or more. Please review the Request for Business Proposal for the Grow GNG Challenge at right for more information about the challenge. GNGDC is accepting applications for new board members. The Gray-New Gloucester Development Corporation - working to build a destination at the heart of it all.